Part of building any hot rod is customization. And one of the details that will give a car its personality (other then engine, paint, etc) are the headlights. They are your car's 'eyes'! Throughout the early years of car design, most all headlights were mounted on headlight bars between fenders. As the 1930s went on, headlight bars would disappear. Soon, all headlights were integrated into the car's fenders, then the grill. Most light-duty trucks were a hold-out until WWII ended. But many new heavy commercial vehicles were still made with fender-top mounted headlights for many more years. So considering the lifetime of pedestal mounted headlight, there are quite a few styles to choose from for a nostalgic hot rod. History Fact: Guide Motor Lamp Company was formed in 1906 in Cleveland, Ohio and became an innovator in auto lighting. The company was purchased by General Motors in 1928 and formed the Guide Lamp Corporation. Vintage brand name buckets from Arrow to Yankee all have their own charm. Some of the most popular like the Dietz and King-Bee have been reproduced to death! But none have ever matched the quality of the early originals. Something common to all the best styles is the lens size. That's because of a 1940 federal law that standardized the 7" lens for all car makers and integrated high/low beam in one bulb. Now any headlight marketed had to be the same size as everyone else's. Thankfully the standard was dropped in 1957, paving the way for the popular 5-3/4" two-bulb system. Many excited car designers quickly integrated this into their next car design --think of the 1958 Bel-Air or Ford Fairlane. In this post, I'll be talking about my personal favorite brand; GUIDE & BLC headlights. They are my favorite because they are easy to find, have good quality, and they come in a variety of shapes. What is B-L-C? In 1936, as Guide continued to grow and expand, the Brown-Lipe-Chapin Co (B-L-C) was named a plant of Guide Lamp Corp. The Syracuse, NY company turned out lamps, bumper guards and hub caps for GM's eastern section of the United States. The four varieties of headlight for hot rods are model numbers; 903-J, 904-A, 682-J, and 682-C. All use the standard 7" bulb with the three prongs on the back. Similarities over all the models are the trim ring, bulb retainer ring, and threaded mounting stud. Over the years there have been minor changes to these parts. But they almost always interchange over all the different models. Differences are the obvious headlight bodies, and the riveted on lower mount. 682-C & 682-J share the same basic body shape, but 682-C has the parking light mounted on top in an indent stamped into the metal. Wiring is also different over the model lines, with exception of 903-J & 682-J which share the same basic design. While 904-A and 682-C have unique wires for each of their parking light component. The earliest buckets had wire sockets underneath, rather then the loomed wires exiting the housing that is most commonly seen. Paint was always black. A chrome trim ring was an upgrade from the painted one. 904-A was the only headlight model, that I have observed, that was chrome optional from the factory. But the majority of the 904-A were still painted black. Tags (pictured above) were not on the very earliest headlights. Before tags, bodies were stamped with the the maker's name, model number, and "MADE IN USA". ALL riveted on tags were silver (nickel) color when new. The brass ones you might see today have had the silver polished off. Tags could also be made of aluminum, the one second from the top is one. The shortest of the headlight bodies. Great looking on any hot rod, especially the small ones like a Model T or modified. Ed Gallagher's early 904-A with light, but no tag. The medium sized body. Only the very earliest 904-A had no light on top and were stamped with the model number on the body (no tag). There is also the 904-A with light, but no tag. Like this one pictured. But all tagged 904-A have lights. 904-A have three wires running out of them like 682-C; high beam, low beam, and parking light. Most common GUIDE bodied headlight. 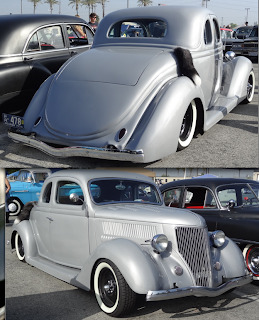 Looks traditional on any hot rod, but is best on larger cars like the '32 Fords and newer. I've observed early 682-J with stamped model numbers (no tags). Only two wires come out the 682-J, like the 903-J. One for high beam, one for low. The 682-C shares the same basic shape as the J. Probably the most popular of all and the most well known headlight. The 682-C is still a 'love it, or hate it' hot rod part. Some guys think they are too large or too "over the top" for a traditional hot rod. They came with a variety of glass parking lights, here are a just a few pictured: the top one I call "sheathed", below that is "big/smooth", and the much celebrated "hawk-bill". The parking light (sometimes converted to turn signal) is held on with one long screw, from the top, keeping the stamped steel light retainer/cover on. Inside is a black foam-rubber gasket that keeps the glass pressed firmly against the retainer. Without the foam the glass will rattle around, but still not fall out. OTB Gear has reproduced the 682-C headlight assembly, hawk-bill variety (and more recently, the 682-J). 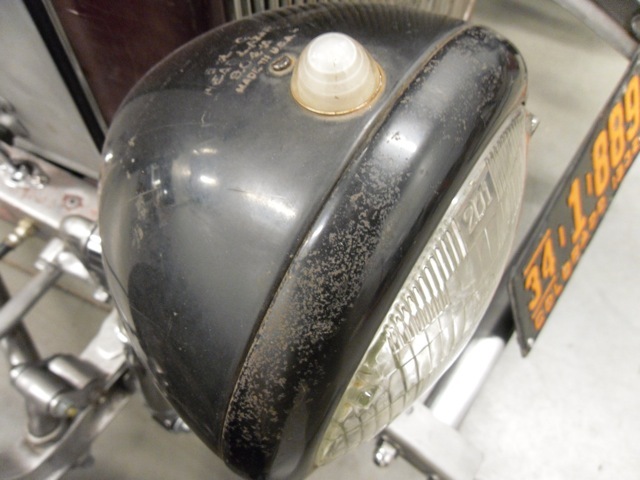 And while they look like the original, the parking light retainer is not interchangeable with a vintage original headlight. Although, OTB does make a chrome trim ring that is top-notch and does fit the original headlight buckets. Here is a size comparison between the 682-C/J, the 904-A, and 903-J on the right. 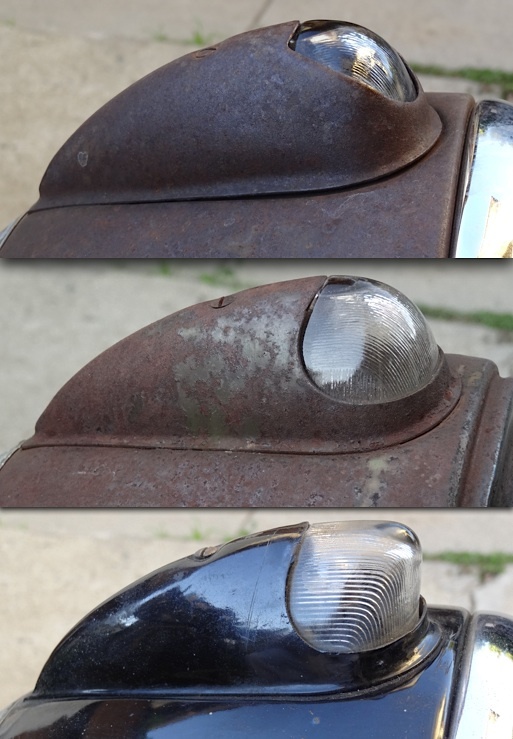 I've broken down a 682-J to show you the parts of this simple headlight. Also note the mounting pad and original wire exit, similar to all. The trim ring is tightened on with one stainless steel pan-head screw, partially hidden inside a cove on the ring bottom. This is unique to the GUIDE/BLC line and is partly what makes these lights so interesting. A look under that is the bulb retainer ring. 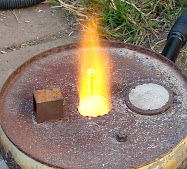 I have seen two ring varieties, one is chromed steel, and another made of stainless steel. Three small, flathead screws hold the retainer down on to the sheet metal body. Rings are also reproduced by OTB Gear. They are nearly impossible to find loose at swap meets. Four screws is all it takes to change a bulb. Early models were equipped with non-sealed headlights, where a smaller bulb was installed in the back of a reflector and lens. That changed as the industry standardized under federal regulation requiring 'sealed beam' bulbs. Rust at the inside back is typical, they were dipped into paint. The wires to the 682-J (903-J similar) consist of the 3-prong plug, two wires exit the housing. All headlights have one wire grounded with a rivet to the body installed at the factory. Covering the wires is a tar/cotton loom, and each headlight had a steel clip that kept the loom and wires from being pulled out the headlight. I found this one by chance, a headlight made by GUIDE even bigger then any 682! It is on an original condition 1937 American LaFrance 400 Series Triple Combination belonging to the Los Angeles Fire Department. I saw it while visiting the LAFD Museum & Memorial in Hollywood, CA, where the truck is on display. I wasn't able to measure the light, but it was of impressive length. It has the same trim ring as any GUIDE, but no tag. Instead it was stamped "GUIDE, Made In USA" at the rearmost point of the body. It had no model number that I could see. GUIDE headlights on a fire truck made in 1937. Year after year, the Throttlers Car Club Annual Picnic never lets me down. The best Burbank has to offer can be found in one place. By no means a large show, but the concentration of vintage rodders (and early rodders) is unprecedented. This year, fellow A-V8ers member Ollin Trujillo joined me in my car for the trip over the Hollywood Hills. We got there nice and early, and as usual the pancakes were as great as ever --not to mention the company. Once again, the conversations turn to back-slapping as we congratulate each other on what fine cars we drive. I have to say, it's as fun as it gets. Gosh, I really love vintage hot rods! The time always flies when you're having fun. With perhaps 200 great cars in attendance, there was plenty to look at. Anybody can go, it's all free (pancakes breakfast is $6). And it is a real, honest-to-goodness hot rod community event. It all feels comfortable, laid-back you know --no music playing, no products for sale. Just a simple gathering of friends. My friend Tim Cicora 21-stud powered V8, 1934 coupe drives great. Proving that this pre-war Davis intake & 2x Winfield carbs do work well on the street. Many enjoyed this ironic 1929 pairing. The least expensive American made car that year, the Ford roadster Model A ($450 new). Parked besides one of the most expensive cars, a Packard Dual-Cowl Phaeton, an exclusive car only for the rich & powerful. Left to right: Tim, Mike, Henry, and Paul Ray II on camera. Mike somehow had a cameraman there for a video, you can view it below. Mike edited it too, and has Glen Aliano doing music. I even made the cut. I'm driving my car near the end. Big news --well not really. After years of teasing, this custom Model T track roadster finally drives in under it's own power. For the last three years at least, the builder has been trailering it in unfinished. The cars has many handmade parts. It's now as impressive now that it is done. The weather couldn't be better, this was a great end to another car show season. Many more cars from the show can be seen on the HAMB, click here. Take a bunch of the coolest hot rodders in So-Cal, invite them to the picturesque Palos Verde peninsula, and what do they do? That's right --talk about cars. Then eventually, they drive slowly around the perimeter of the said peninsula, wooing crowds while trying not to get lost. We were wowed by the Keith Tucker collection. 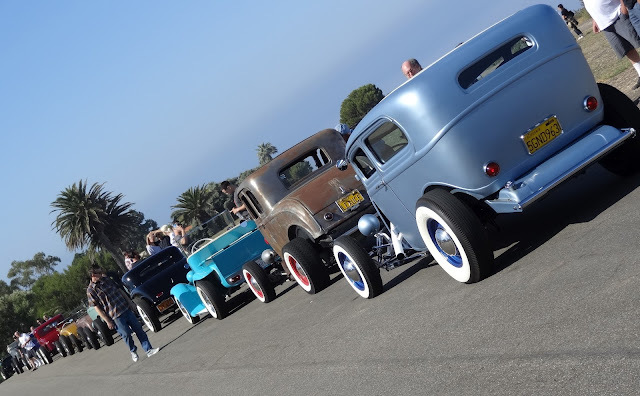 The First Annual Palos Verdes Hot Rod Cruise, directed by the incomparable Lynn Bird, was fun for the participants as well at the general public. Who seemed to enjoy waving at us from the sidewalks and from within other cars. Lynn's 'Surf Kart' would be driven by his sons. Many of the planned stops along the way included scenic views of the blue Pacific and nearby industrial harbor. At each point, crowds gathered around our cars to snap pictures and look at them inquisitively. The day started early with everybody meeting at the Tucker Car Collection in San Pedro. Keith Tucker owns & maintains a large collection of vintage cars and automotive ephemera collected mainly by his late father. It is also where Keith grew up and where his mother Patricia still lives. The large quarter-acre lot had several large garages, and plenty of space to work on cars. There were so many great vehicles there and vintage gas station signs, I could have spent the entire day just looking around! Scott Miller's Cadillac powered coupe. It wasn't long and we were off to the first stop; Palos Verdes Drive overlooking the Pacific Ocean. After the few miles of driving with all the cars in a line, the short 30 minute cool-down stop was just enough time for photos ops, chit-chat, & snacks. Another stop included the Point Vicente Lighthouse (parking lot) for more discussion and car talk. Lynn was also debuting his latest hot rod, this roadster pick-up on the right. Here Dave Steele & Vic Cohen are inspection the details. It was also a shake-down run for Lynn's new new engine. Luckily, the only part to fail was the distributor rotor which broke in half on his way home. A frustrating, but easy fix. Jon Fisher's Valley Custom coupe. Next was the Korean Bell Of Friendship, which located on a majestic hilltop. We walked away from the cars and gathered around the shade of the bell's pagoda only to talk about cars again and upcoming events. What a great looking group of hot rods. That's my car (with the freshly dropped headlight bar) right in the middle. Our group keeping cool at the Korean Bell, Palos Verdes. Oh sure, there were other subjects we talked about. But all I remember was enjoyable debates & opinions of the automotive type. It is great to have something in common with interesting people. The cruise ended with the buffet lunch at Acapulco Mexican Restaurant on the harbor. It was good finish after a long drive in an open car.